Paper hearts of daddy. Daniel turns one over each day to a special saying or sweet reward. Father’s Day arrived again. In our home, Father’s Day certainly is an excellent reason for celebration. Why shouldn’t it be with the world’s best daddy in the house? Oops, did I say that? To the rest of you fathers, don’t take that personally. It’s just that Julia and Austin both absolutely adore their daddy and so do I. We love doing little things to show him how much he means to us. Recently Julia and I traced hearts onto pretty pieces of paper, cut them out, and wrote little messages on the back of each one. We worked on it every now and then while my husband, Daniel, was at work and kept it a secret. Finally we were ready to fasten them side by side onto a string. 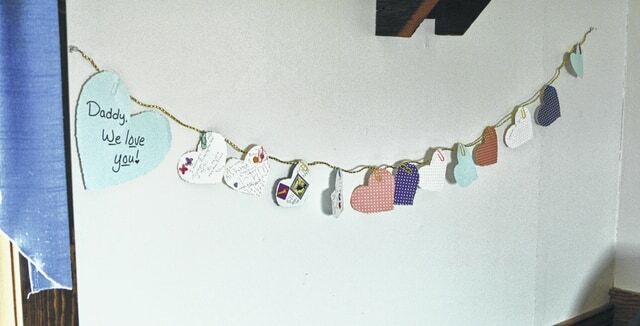 We then hung our chain of hearts onto a wall in the living room. The side with the little notes was turned back so he couldn’t see what was written on them. That afternoon we were extra eager to have Daniel return home from work. Upon his arrival, Julia excitedly showed him the surprise we made for him. “Each day you may flip around one heart and read what it says on the back,” we instructed. A year ago Julia overheard us talking about Father’s Day. She piped up, “Someday I am going to have ‘Fadder’s Day too.’” You never know what cute things will come out of a 2-year-old. I will never fully be able to know what my dad has done for me throughout my childhood and teen years. When I was with him, I felt a deep sense of security. I knew that, no matter what, he’s always out for my good even though his ideas weren’t always the same as mine. I can just hear him say that he has also made many mistakes. Yes, I don’t expect perfection from any dad, or anyone else, for that matter. We as parents all long to see our little ones growing up to be respectful, godly young people. Isn’t one of the greatest gifts we can give to them is to personally abide in love, a true love that is deeply rooted in God’s love and thereby extended to each other as a couple and passed on to the precious young souls whom God has entrusted into our hands? We all face times when we’re weary and love is a challenge. It has been an inspiration for me to take a look at the life of Jesus. He also faced times when he felt weary, was ridiculed and simply ready for a break. In spite of it all, He faithfully kept serving others, one step at a time. Pat into a 8-inch pie pan, covering the bottom and sides. Next, put cups of vanilla ice cream in the crust and freeze. If desired, top with fruit glaze or pie filling before serving.